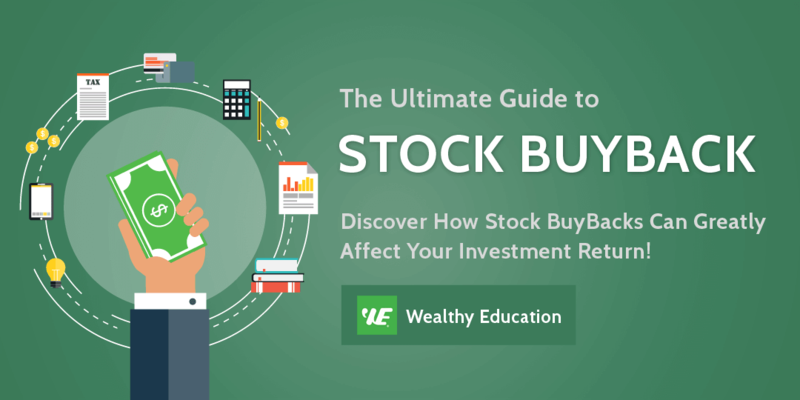 ​What is a stock buyback and how does it actually work? ​So what does a stock buyback mean? Stock buyback, often known as stock repurchase, offers a way for companies to return some wealth to their shareholders, while potentially boosting their stock prices. While stock repurchases are not always initiated with the best of intentions, there are actually a number of valid reasons why a business might decide to offer one to its shareholders. Your portfolio will benefit from understanding exactly what lies behind a particular company’s decision to do so. In this article, we'll dive into some advantages of stock buyback​ and all the reasons behind why would a company repurchase its own stock. What happens when companies buy back stock? So is it good when a company buys back stock​? Stock buyback happens when a company purchases its own stock, either on the open market, or directly from its shareholders; it's known as a "share buyback", or "stock repurchase". Generally when this happens, the company will absorb or retire these repurchased shares, and re-name them treasury stock. Share buybacks are commonly used to create or enhance shareholder value in a number of different ways. A stock repurchase plan can be a good way for a business to reinvest in itself, by using any excess cash at its disposal to buy back shares of its own stock. This is usually a welcome sign that a company is in a positive cash flow situation, and it often serves as a catalyst to increase the company’s stock price at the same time, further increasing shareholder value. When a share buyback is announced, stock prices tend to shoot up accordingly as investors rush to take advantage of the higher demand and lower supply situation. A stock repurchase can also help to bridge the gap between what a company’s shares are currently selling for, and what they theoretically should be selling for, in terms of the company’s book, or intrinsic value. When a company believes i﻿ts stock is undervalued, buying some of it back from the marketplace will have the overall effect of raising its current selling price to one that is more in line with its inherent worth. Under the right circumstances, a stock buyback can be highly beneficial to you as a shareholder, since fewer outstanding shares in the marketplace automatically gives you a greater claim on a company’s earnings. This can translate into higher individual returns, and better investor value. The most common stock buyback approach is through the open market. In this case, a company simply buys its own shares at the current market price, in much the same way that you would do as an individual investor. When a company presents a tender offer to its shareholders, on the other hand, it’s effectively offering to buy back some or all of its shares directly from them. A tender offer generally states the total number of shares the company is looking to repurchase, the price range it’s willing to pay per share, and the expiry date of the offer. A stock repurchase of this type usually involves paying shareholders a share price that is significantly higher than the current market value. The final, and least common, way that a business can buy back its own shares is to negotiate their purchase privately, and directly, from a large individual shareholder. ​When motivated by positive intentions, companies engage in stock repurchases to help boost shareholder value. There are 6 main ​reasons for stock buyback, let's find out which of the following are effective ways to try to boost a company's stock price. Quite often, a company will use a stock buyback to pump up the price of its shares when it believes they have become undervalued in the marketplace. In this case, a share repurchase would serve as your signal that the company has great confidence in itself, that it believes its shares have been unfairly discounted as far as their int﻿﻿rinsic worth﻿﻿ is concerned, and that it’s willing to back up that belief with cold, hard cash. There are a number of reasons why a company’s stock price may currently be lower than it reasonably should be, including a one-time scandal or negative news event, or the failure to meet expected earnings predictions. Share buybacks are often used to provide current shareholders with a cash distribution, and this is viewed as a bonus by many investors. But because companies usually pay a premium to buy back stock from their shareholders, it means there’s an inherent risk of transferring money directly out of the pockets of long-term shareholders, and into the pockets of those participating in the buyback. This can be a distinct disadvantage if you are an investor who chooses to hold onto your stocks for the long run. On the plusside however, a share repurchase often results in a stronger stock price. This can add a certain level of security to your portfolio, particularly since many company buyback programs are implemented during market declines to help bolster and support stock prices. One of the main ways a stock repurchase can improve your investment value is through an increase in Earnings per Share (EPS). This fact is based on a simple mathematical formula. If a company removes some of their outstanding shares from the marketplace by buying back stock, it means that their annual earnings will be distributed among fewershares, and that each of those shares will be entitled to a greater portion of those earnings. Furthermore, a rising EPS is often linked to an increase in stock price, providing even greater investor value, since there will be a higher demand for a stock that is seen to be growing its earnings. Share buybacks provide a viable way for companies to reduce their cash outflow, without actually having to cut their dividends. Fewer outstanding shares mean fewer dividends to be paid, and a business often stands to save a significant amount of money when this difference far outweighs the cost to repurchase the shares. Capital structure is the way in which a business funds its growth and operation, generally through a combination of debt and equity. When a company initiates a stock buyback, it effectively changes its capital structure, because fewer outstanding shares equates to less outstanding equity. This change in structure has the benefit of increasing a company’s Return on Equity (ROE), simply because its generated returns are now linked to a lower level of equity. And a higher ROE is definitely viewed as a positive feature in the marketplace. Sometimes a large shareholder or seller of a specific stock is looking to liquefy their holdings, and the stock-issuing company may offer to buy back their shares from them. The following situations describe 6 ways that a company’s decision to buy back its own stock can lead to potential loss inside your portfolio. If you’re a long-term investor, the end-result of such a ploy will likely offer very little in the way of benefits. And if the temporary manipulation of EPS just before an earnings announcement was the company’s main stock buyback goal, you may want to reconsider your holdings with them. And while the intention behind this perk is positive, since it results in managers becoming personally invested in the performance of the businesses they run. The potential downside is that many executives will use stock repurchase plans to maximize their returns, by keeping outstanding shares down, and EPS up. Sometimes it’s done because the company expects that its ever-increasing operational earnings will ﻿serve to ﻿pay off the debt in a timely enough fashion to make it worthwhile. Other companies believe that using debt in this way is financially efficient because, unlike s﻿﻿hare dividend ﻿payments, loan interest is tax deductible. You should also watch for companies that use stock repurchase announcements to try and lift the price of their stock, without actually following through on their plans. Many share buybacks are announced, but never fully implemented. Now you understand exactly why companies buy back stock and how this practice can help boost the stock prices and increase shareholders' value. Like so many other investment events, share buybacks can turn out to be either a good thing or a bad thing for investors, depending on the circumstances. There are a number of situations where companies may choose to buy back their shares for all the wrong reasons. It’s important that you do your research and study a company’s financial reports in order to determine the true reason behind their decision to buy back shares. At the best of times, this decision will be based on a strong desire to promote shareholder value. But if a business is indiscriminately engaging in a share repurchase when their stock is o﻿vervalued, and they are using debt to do it, the end result is likely to be quite devastating for the shareholder.